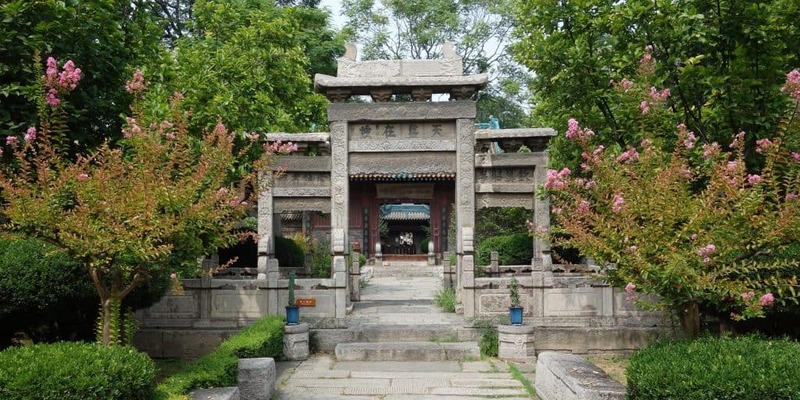 Xian, China’s former capital in the west, is often considered the end of the Silk Road. 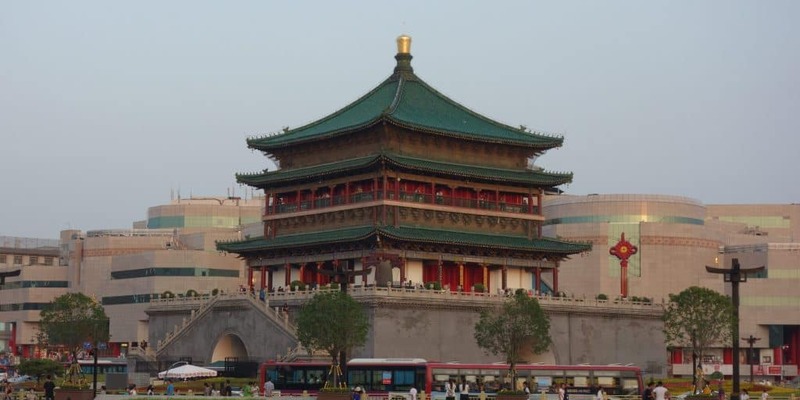 It is one of the most interesting Chinese cities we traveled to, with its mix of Chinese and Muslin traditions, old buildings sprinkled throughout the city centre and the famous Terracotta Warriors nearby. It is easy to spend two or three days here, maybe even more, without running out of things to do. The Terracotta Warriors are Xian’s most famous sight. Discovered by a local farmer, this giant grave has not yet been completely excavated. Underneath the earth lie hundreds of warriors, most of them shattered into pieces. You can see three different pits and a museum, in which the chariot has been preserved. Two of the pits are small, one has barely been excavated, and it is the third pits whose images you know from magazines and TV. Lined up, you will see the Terracotta Army guarding the tomb. 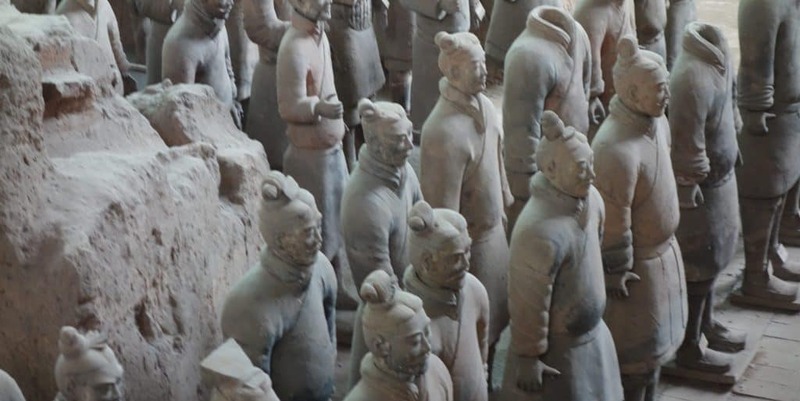 Unfortunately, since the Terracotta Warriors are so famous, you will have to share the site with thousands of tourists. Getting close to the warriors is not permitted and you have to fight with other visitors to see them at all, which made the whole experience a bit underwhelming. If you have a camera with a good zoom, take it. It is still a cool place to visit. Bring a couple of snacks and a lot of patience and I am sure you will enjoy the warriors. The night market in Xian’s Muslim Quarter was my favourite part of the city. 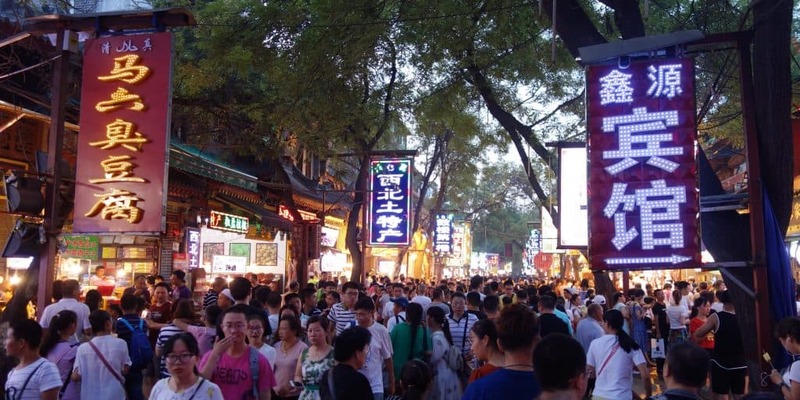 Spread out along several streets and alleys, you will find both souvenir and food stalls. Come here for dinner and try as many dishes as you can, from fried potatoes to squid on a stick. We also found an excellent dumpling restaurant in one of the small alleys. Make sure to leave some room for desert. I highly recommend the shaved yoghurt ice cream, but if you prefer rice cakes or fried banana, you can find them here as well. Have you ever ridden a tandem bike? It is a lot harder than it looks. It took us a while to find our balance and we kept wobbling as we tried to go in a straight line. But once we got the hang of it, it was great fun. 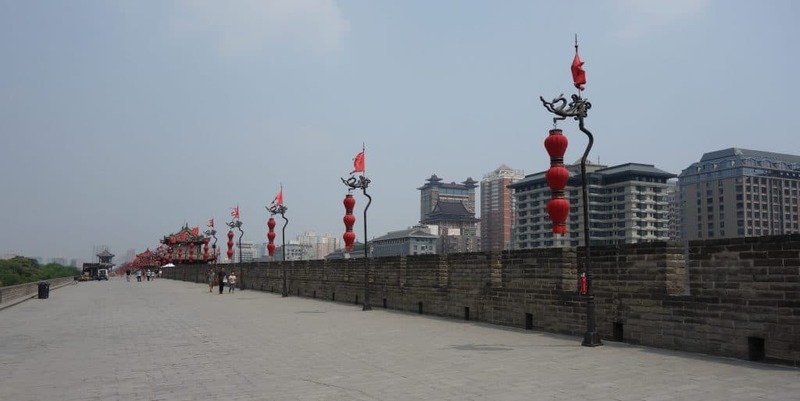 Riding a bike on Xian’s city wall is the best way to see it. It has a total length of almost 14 km and bikes are available for rent on top of the wall. You don’t have to go with a tandem bike if you don’t want to, they have regular bikes as well. Since we were leaving on a night train that afternoon, we visited the city wall in the middle of the day. We hadn’t even been on the bike for five minutes and were soaked in sweat, so try to come here in the morning or evening. If you think mosques are all about domed buildings and Arab architecture, come to see Xian’s Great Mosque. All you will see is Chinese architecture, blending perfectly with Muslim traditions and conventions. The minaret is constructed in the shape of a pagoda, the roof tiles shine in a brilliant shade of turquoise. At the entrance, you will get a leaflet explaining about the mosque, its history and its different parts so you understand what you are looking at. Drum and Bell Tower, located close to each other, were the first buildings I noticed when we drove into Xian. One of them is located inside a round about, while the other marks the entrance to Xian’s Night Market. Both of them are impressive to watch from the outside, but you can also go inside and climb them, if you like. Ask at the ticket booth about the drum performances so you can time your visit right to see them.